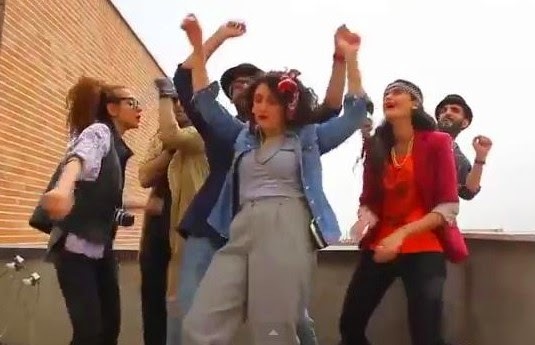 After a group of young Iranians posted a homemade video of themselves dancing to Pharrell's hit song and international sensation "Happy", the group of six was arrested and forced to repent on state TV (Video below). The video, which has been reuploaded above, features six jubilant young Iranians following in a viral trend that people in over 140 countries have picked up on. When the Tehran-based video itself began to go viral, authorities took notice. During their appearance on state television, the six said that they had no idea the footage would be broadcast. The report also included a warning from Tehran's police chief to the youth of Iran not to be seduced by the filmmakers behind viral videos. The officer, who referred to the exuberant video as "a vulgar clip which hurt public chastity," also claimed that it had taken the authorities only a matter of hours to identify and arrest the participants, even though the video was uploaded a month ago. 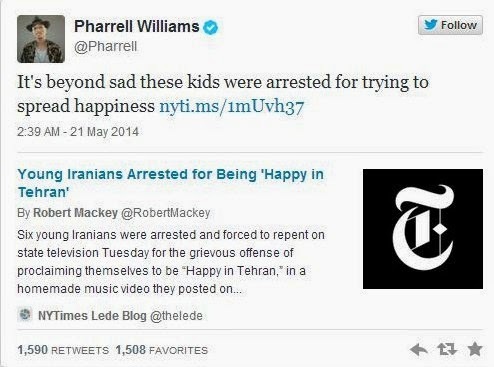 The "Happy in Tehran" controversy, which began after the video reached publications like Le Monde and The Huffington Post, eventually came back to the writer of the song, who tweeted his disappointment at the news of the arrests. According to the New York Times' Tehran bureau chief, Thomas Erdbrink, the arrests illustrate discrepancies between governmental policy and Iran's judiciary. Iran's president, Hassan Rouhani, argued just last weekend that Iran should begin to embrace the internet. The original purpose of making the video, one of the dancers shared, was to show that Iran's young people "have moments of joy and happiness even though they live with many difficulties."